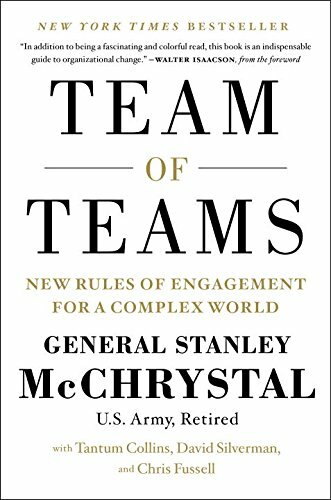 Team of Teams, written by retired Army General Stanley McChrystal with Tantum Collins, David Silverman, and Chris Fussell. General McChrystal calls on his experience commanding special operations forces in Iraq to challenge the status quo of centralized command and control. When General McChrystal took command of the Joint Special Operations Task Force in 2004, he quickly realized that conventional military tactics were failing. Al Qaeda in Iraq was a decentralized network that could move fast, strike hard, then vanish into the local population. The allied forces had an advantage in numbers, equipment, and training—but none of that seemed to matter. In this powerful book, McChrystal and shows how the challenges they faced in Iraq can be rel­evant to countless businesses, nonprofits, and other organizations. The world is changing faster than ever, and the smartest response for those in charge is to give small groups the freedom to experiment while driving everyone to share what they learn across the entire organization. As the authors argue through compelling examples, the team of teams strategy has worked everywhere from hospital emergency rooms to NASA. It has the potential to transform organizations large and small.